I'm due for a rewatch myself so I can't be too specific here, but I seem to remember there being a fair bit of 'magic' (for lack of a better term). The technomages for one, though that's obvious and possibly excusable. Everything fate related. Londo seeing his own death is just an extension of the magic that's already securing the major plot points in place. Also, I never truly took this as crossing the threshold into magic, just superstition. Hell, there have been a few points in my life where if I had to guess at the manner of my death I probably would have answered with "engaging in mortal combat with a specific co-worker". Jason Ironheart transforming into energy. As you say, Soul Hunter. Minbari souls going into humans, in general. Probably more but that's all that comes to mind. Spoilers for later seasons of B5 below. Skip this entire comment if you're concerned about spoilers. Since I wrote my previous replies on this thread, though, I have read the Soul Hunter thread (I haven't yet gotten around to posting in it ), and I found that some of this stuff is much more ambiguous than I thought and that it was made and presented that way on purpose. I actually really like the ambiguity surrounding the Soul Hunter stories, which I previously assumed to be straightforward "magical" .... but I'll put that in the appropriate thread. Technomages: It's specifically stated in The Geometry of Shadows (and probably again in Crusade, but I have only watched that once so far, so I can't say for sure) that technomages use technology to simulate "magic". There is no real magic involved, and I think that's supposed to be obvious to both the B5 audience and the people inside the B5 universe. I could be wrong about the second .. there must be some reason they try to create this illusion. "Fate". That's an excellent example, and probably more ambiguous than I assumed. I had assumed that in case of the Centauri it was meant to be an actual "supernatural" element, but perhaps it's as open to interpretation as the soul hunter stories. In the case of the Minbari belief in fate, I think it's portrayed as a whole lot of superstition that is (somewhat reasonably) based on time travel shenanigans. Telepaths: It is never explained to the viewer exactly HOW telepathy works in the B5 universe, but we do find out how human telepaths (and those of the other younger races) came to be. There's nothing supernatural there, just Vorlons messing around. Jason Ironheart: That's another story I never interpreted as anything supernatural, but it is clear that the characters on the show don't REALLY understand what happened there. Still I don't think any of them assumed "magic", just something that's very rare and entirely outside their area of expertise. Soul Hunter: For me, that is one of the harder ones to find a "reasonable" explanation for, but it COULD be done. I'll talk about it more in the other thread. Humans with Minbari Souls: I always thought that was meant to be something Minbari believed .. or at least SOME Minbari. It was never meant to be in-universe "truth", was it? There's some other things that could be added to that list, like Sheridan's amazing resurrection and whatever happened to him at the time of his (second ) death. Again, I always assumed that that was supposed to be a fairly straightforward not-at-all magical thing to the B5 viewer, but something that may have seemed possibly supernatural to the in-universe observer. But, maybe to some other viewers that is also a clearly supernatural plot, I really don't know. I can see where you were going with it now. I was going with "magical" in the sense that they didn't even try to put science behind it. For example, jump gates, vaguely sciencey. Ship battles, spiced for television but with an eye for science. Technomages, they say "science did it" in the same way you'd say "a wizard did it", so magical. This is intentional though, so I don't mind too much (even if I don't care for them). Jason Ironheart transforming into energy, "science did it" level of magical. Telepaths, "a vorlon did it". The souls Soul Hunters collect depend on your interpretation. They're either sciencey imprints of a person or magical souls, but they definitely become magical whenever they escape and affect the real world in some scene I can vaguely remember. The Minbari/human souls were intentionally vague so probably don't fit in the list. Sheridan's end-game (along with Kosh) are also what I would qualify as magical, but I only generally remember what happened and not well enough to discuss. Londo seems far too uncontrolled at this point. I get that he's had almost no character development yet, but he's Centauri. He shouldn't be running through the halls with a gun, he should be slipping something in G'Kar's drink, or hiring somebody, or using one of the millions of other ways they have to assassinate somebody. "Would you really have killed me, Mr. Garibaldi?" Of course he would have, if you drew a gun. You know this. Stop pandering to the viewers to make Garibaldi seem tough. Talia seemed rattled to have the murder-thought intrude on her mind. How green is she that a little thing like an angry thought can put her that off balance? I'd expect a P5 to have much better composure. It's not like she's emotionally attached to any of these people yet. I guess Ivanova's conversation with Talia explained things well enough, but C.C. seemed a little too meek and vulnerable in this scene. Yes, it would be a topic that would soften your defenses, but I don't buy that she'd open up to Talia that quickly just for stopping a random murder. She's had a lifetime to build up her mental walls. Delenn looks different, compared to the Gathering. Amazing what a facial can do. G'Kar is much lighter too. I prefer the new versions. Delenn was less mysterious here. Instead of an enigmatic sage persona, she seemed like any other random member of the cast. The military advance was called off far too easily. So you caught a Narn with some raiders? "We disavow all knowledge of this renegade merchant. And no, you can't have that planet back." Also, what kind of stupid deal did the raiders engage in? You get a manual with purchase, you don't get a free Narn for life. This guy is supposed to make sure it's never re-sold? His life from this point on is devoted to being some sort of living DRM, and getting blown up with the raiders whenever they bite off more than they can chew? Not a lot of room for career advancement. Speaking of DRM, do you think Duck Dodgers is in the public domain at this point in time? Or have copyright extensions ensured that even at that point in time you have to pay 100 credits per episode? I also noticed that I watched this episode of Babylon 5 on a larger TV in my bedroom than he watched Duck Dodgers in his main living area. Surely with all the video stuff they do, they'd have one large viewscreen for entertainment and communication. And Garibaldi's laugh... I had no idea Babylon 5 would still be using lead paint and that so many paint chips would be falling into Garibaldi's meal. Overall, this one was less memorable than the Gathering. I kept having to force myself to remember what happened in this episode because my thoughts kept drifting to the Gathering, despite having watched it two days ago and this one last night. Characters are still finding their place, and the exposition is getting crammed in hard and dry. 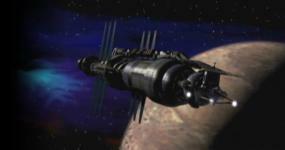 I didn't dislike the episode, but I hope I reach that "Babylon 5" feeling soon instead of this "Babylon 5 setup" feeling. Interesting, I like MoTFL (I too am "in touch with the scene"! ) a lot better than The Gathering. I like The Gathering for what it is, but with everything in there that got changed it feels more "setup-ey" than anything else. MoTFL feels solidly like Babylon 5 to me. I'm fully aware that I may be over-analyzing things which is causing this "setup" feeling. One way or another, I should get over it in a few episodes. Now, what happens in MotFL? It starts off with promise, two races on the brink of war... And then they have some meetings about it. And one guy gets kinda mad and almost shoots another guy, and then doesn't. I guess there's a neat, slow space battle with raiders, and then it turns out that they capture a guy and use him to make sure there's no war. I know what B5 will become and do care about these characters, but before you care about them, what does the episode really offer to a new viewer? Some neat potential, but does it really deliver much yet? Where's my "What do you want?" Where are my high-intensity space battles? Where's my chunky nougat with a spoo filling? Overall, I do feel like the first season feels a bit like a setup for the "good stuff" that comes later. I think it's when I remember that feeling and go watch some season 1, it can still really surprise me. I definitely like season 1 better than season 5, because it just feels more connected to everything (for obvious reasons). While I think that B5 has some EXCELLENT space battles, I'm not sure I would have missed them if they hadn't been included. Obviously I can't say that for sure, but my love for B5 is based mostly on the overall story rather than any individual detail. I don't think B5 NEEDS epic spacebattles to be amazing. I just really dig the politics and stuff. Season 1 really isn't lacking in that regard, even if there isn't much happening yet. For the record I love the style of space battle in Midnight (or MotFL if you prefer!). It made Sinclair look like an excellent pilot. So I thought it was a shame that style pretty much disappeared later on for a more Star Wars style, as great as that was. I guess it did slow things down too much though. I always found the season openers to have a strange feel to them. It's kind of hard to explain, just something about their tone, as though it takes the series a couple of episodes to find its groove while the season opener tries new things out. I do like Midnight but when you dissect it as you've done it really does reveal some flaws, like it's trying too hard. The dialogue is very expository, stuff like Londo going after G'kar with a gun does, I agree, feel very un-Londo like, as though it is there just to provide some more thrills to the episode. One of the things I liked about it was that there was an election.You'd never see that in Star Trek! The election, and the presence of bars and restaurants and news channels automatically made B5 feel more real than Star Trek. I also think Sinclair comes across well in this episode. I like his little talk with Ivanova – "Focus on what you see" – and with G'Kar "You want me, you know where to find me". He has the diplomatic skills of Picard but also the 'go get em' attitude of Kirk. Getting the thread somewhat off topic here, but I thought of another thing I forgot to add to that "list". Day of the Dead! > not sure I would have missed (space battles) if they hadn't been included. They're not enough to carry the show, I agree, but I believe they won several awards for them. It's a nice addition to everything else. I agree with what you say, in general, but if they'd kept things at this pace then there'd be no way the fighters could ever survive. A single targeting computer with a rotating turret could clear an entire squadron. Which is what technology should do anyway, but it would make for terrible television.